September 03, 2018, 2:05 p.m.
A third (35%) of us think about our own mortality at least once a week or more, new YouGov research in conjunction with Co-op Funeralcare shows. The new study uses YouGov Custom Research data to examine national attitudes towards death, and is the first time the subject has been looked at on such a large scale, with 30,000 survey respondents involved. The data shows that nine in ten (91%) Brits have thought about their own mortality, with a third thinking about it once a week or more. The average age that Brits first consider their own mortality is 26. 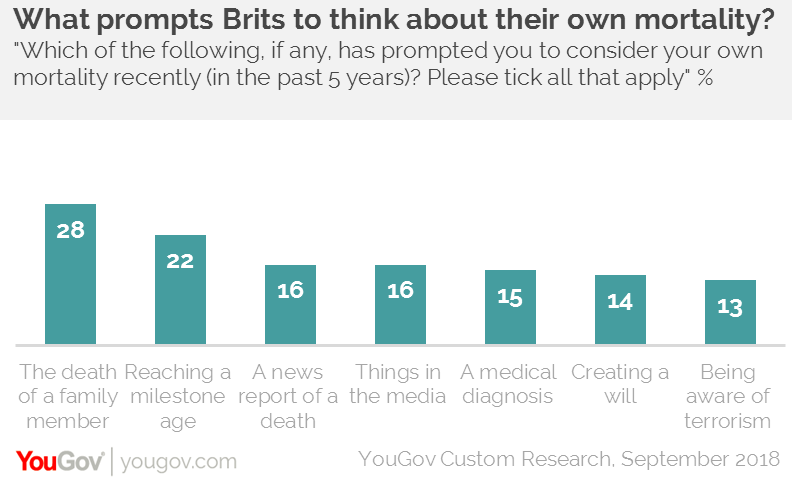 Almost one in five (16%) have been prompted to think about their own mortality based on things they have seen in the media. Other factors that lead people to ponder the topic include the death of a family member (28%), reaching a milestone age (22%), a medical diagnosis (15%), a news report of a death (16%), creating their own will (14%) and being aware of terrorism (13%). It tends to be women that are most likely to think about death. Women are more likely than men to have considered their own mortality (93% vs 90%), reflected on their parents’ mortality (91% vs 88%) and avoided talking about death as they have been worried about upsetting people (22% vs 16%). The data shows that over two thirds (70%) of UK adults have suffered a bereavement in the last five years, with four in ten (42%) of those having experienced the death of more than one person close to them. People in the UK tend to deal with bereavement in different ways. Almost half (45%) talked about the person with other people following their death, whereas many kept themselves as busy as possible (24%). Some (16%) kept it to themselves, others (13%) did something positive to distract themselves e.g. met up with a friend, while 12% got back to work as soon as they could. Just 2% of adults have sought bereavement counselling.